UNIVERSAL CITY, Calif. — July 11, 2016 — NBC and Universal Television return to San Diego Comic-Con with all-star panels for its new and returning shows, including this fall’s new action-adventure series “Timeless” and freshman comedy “The Good Place,” starring Ted Danson and Kristen Bell, along with NBC’s take-over of Gaslamp Square featuring fan activities that includes an adventure ride, socially shareable activities and giveaways. 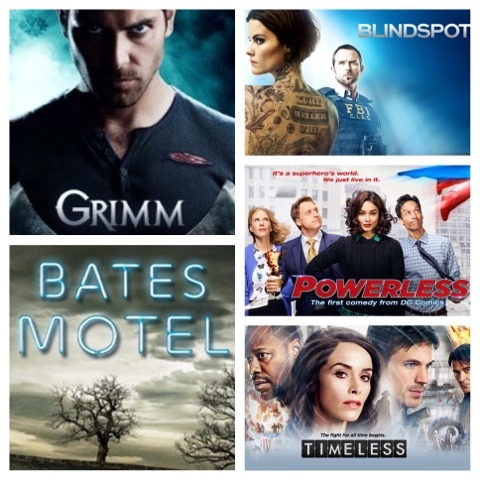 In addition to “Timeless” and “The Good Place,” panels and screenings will be held for “Blindspot,” “Grimm," and new midseason comedy “Powerless,” along with exclusive first-looks of freshman mid-season dramas “Emerald City” and “Midnight, Texas,” as well as Universal Television produced drama series “Bates Motel.” Plus, NBC will also host its annual invite-only party at 7 p.m. Saturday, July 23 on the Andaz Hotel rooftop. Comic-Con attendees will be treated to three exciting NBC activations, giveaways, photo opportunities, exclusive content and more at Gaslamp Square (between the Convention Center and Hard Rock Hotel) starting Thursday, July 21 through Sunday, July 24. Go on a time-bending adventure with NBC’s new fall series “Timeless,” as fans get to ride on a “Gravitron” and take a shareable motion graphic photo that captures their time-travel experience. Your mission: to protect the past and save the future. Discover the world of “Emerald City,” NBC’s midseason drama series, as it takes over Tin Fish restaurant. Fans can take an animated sharable photo as an “Emerald City” character. Get a taste of “The Good Place” when you need a break from the heat with free fro-yo at the pop-up frozen yogurt shop. In partnership with Comic-Con, the official Comic-Con App, brought to fans by NBC, offers attendees and TV fanatics a comprehensive mobile companion to the conference, including a dynamic schedule with live updates, interactive exhibit hall map, panel details and popular events. Plus you can collect your favorite moments and share with friends and sync your personal schedule on Comic-Con.org with the app. The app update will be available for download starting July 14 on the App Store or Google Play. From executive producer Michael Schur (“Brooklyn Nine-Nine,” Parks and Recreation”) and director Drew Goddard (“The Martian”) comes a smart, unique new comedy that follows Eleanor Shellstrop (Kristen Bell, “House of Lies,” “Veronica Mars”), an ordinary woman who, through an extraordinary string of events, enters the afterlife where she comes to realize that she hasn’t been a very good person. With the help of her wise newfound afterlife mentor (Ted Danson, “CSI,” “Cheers”), she’s determined to shed her old way of living and discover the awesome (or at least the pretty good) person within. “The Good Place” premieres at 10 p.m. ET/PT Monday, Sept. 19 before moving to its regular 8:30 p.m. Thursday timeslot Sept. 22. Become a fan of #GoodPlace on Facebook at https://www.facebook.com/NBCTheGoodPlace/ and follow the show on Twitter @nbcthegoodplace. It’s a superhero’s world. We just live in it. Join cast members Vanessa Hudgens (“High School Musical”), Danny Pudi (“Community”) and Alan Tudyk (“Suburgatory”), along with executive producer Ben Queen (“A to Z”) and executive producer/director Michael Patrick Jann (“Reno 911”), for a screening of the pilot and Q&A covering the first comedy series set in the DC universe. “Powerless” is the story of Emily (Hudgens), a young insurance adjuster specializing in regular-people coverage against damage caused when Super Heroes and Super Villains treat the city like their own personal battleground. Taking care of insurance needs one by one, Emily and her team of co-workers might not have any superpowers but they are out to make a difference in people’s lives and prove that you don’t need to have powers to be powerful! From Warner Bros. Television and based on characters from DC, “Powerless” premieres midseason on NBC. Become a fan of #Powerless on Facebook at https://www.facebook.com/NBCPowerless, and follow the show on Twitter at @NBCPowerless. A&E’s hit drama series “Bates Motel” returns to SDCC on the heels of the pivotal season 4 finale. Join the cast: Vera Farmiga (“Norma”), Freddie Highmore (“Norman”), Max Thieriot (“Dylan Massett”) and Nestor Carbonell (“Sheriff Alex Romero”) along with creators and executive producers Kerry Ehrin and Carlton Cuse as they reveal exclusive content from the new season. Come join us and find out what's in store for Season 5! Following the shocking first-season finale, join “Blindspot” — last season’s # 1 new drama series on broadcast TV — as it returns to San Diego for its second appearance at Comic-Con! Sullivan Stapleton (“300: Rise of an Empire”) and Jaimie Alexander (“Thor: The Dark World”) star in this one-hour action thriller from Berlanti Productions and Quinn’s House, Inc. in association with Warner Bros. Television. Stapleton stars as hardened FBI agent Kurt Weller, who is drawn into a complex conspiracy when a mysterious woman, with no memories of her past, is found in Times Square, her body completely covered in intricate cryptic tattoos. As Weller and his teammates at the FBI — Edgar Reade (Rob Brown, “Treme”), Tasha Zapata (Audrey Esparza, “Blackbox”) and the tech-savvy Patterson (Ashley Johnson, “Much Ado About Nothing”) — begin to investigate the veritable roadmap of Jane Doe’s tattoos, they are drawn into a high-stakes underworld that twists and turns through a labyrinth of secrets and revelations — with the information exposing a larger conspiracy of crime, while bringing her closer to discovering the truth about her identity. Join us for a special video presentation followed by a Q&A with series stars Sullivan Stapleton, Jaimie Alexander, Rob Brown, Audrey Esparza, Ashley Johnson and writer/executive producer Martin Gero. “Blindspot” returns to NBC for its second season on Sept. 14 at 10 p.m., before moving to its regular timeslot of Wednesdays at 8 p.m. the following week. “Blindspot: The Complete First Season” will be released on DVD and Blu-ray Aug. 2. Become a fan of #Blindspot on Facebook at https://www.facebook.com/NBCBlindspot and follow the show on Twitter @NBCBlindspot. In addition, Adria Arjona, who stars as Dorothy, will give fans an exclusive first look at NBC’s new Oz-reimagined series “Emerald City,” followed by an exclusive sneak peak at “Midnight, Texas,” based on the hit book series from author Charlaine Harris (“True Blood”). From the creative minds behind “Revolution,” “Supernatural” and “The Blacklist” comes “Timeless,” a thrilling new action-adventure series in which a mysterious criminal steals a secret state-of-the-art time machine, intent on destroying America as we know it by changing the past. Our only hope is an unexpected team — a scientist, soldier and history professor — who must use the machine’s prototype to travel back in time to critical events and uncover the mystery behind this dangerous fugitive’s actions. Preview an exclusive premiere screening of “Timeless” and join Abigail Spencer (“Rectify,” “Oz the Great and Powerful”), Matt Lanter (“Ultimate Spider-Man,” “Star Wars: The Clone Wars”), Malcolm Barrett (“Key and Peele,” “The Hurt Locker”), Goran Visnjic (“ER,” “Extant”) and executive producers Eric Kripke (“Supernatural,” “Revolution”) and Shawn Ryan (“The Shield,” “Mad Dogs”) for a Q&A session. “Timeless” premieres Monday, Oct. 11 at 10 p.m. on NBC and is produced by Sony Pictures Television. Become a fan of #Timeless on Facebook https://www.facebook.com/NBCTimeless/ and follow the show on Twitter @NBCTimeless. Preview Night Is A Wrap!